Two-stage PDC-13-300-3750 fully instrumented high pressure reciprocating diaphragm compressor for helium recovery. Located in Brazil, this helium compressor fills tube trailers boosting pressure from 1.5 bara to 251 bara. Flow rate is 97 Nm3/hr. Power is 56 kW. 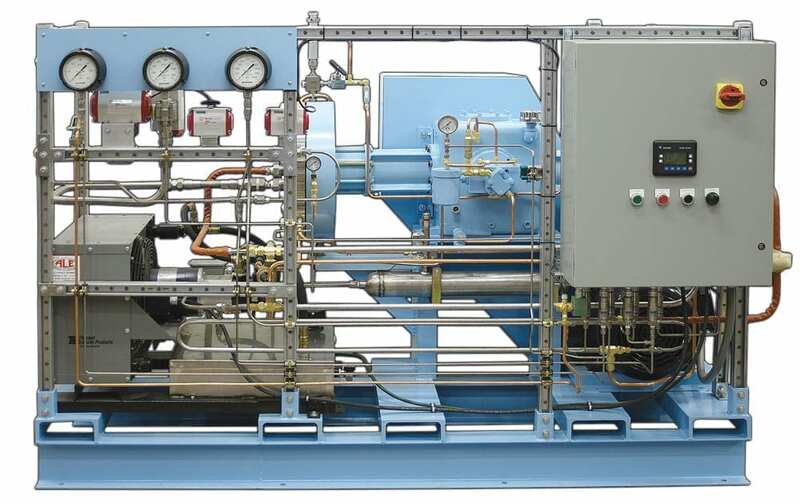 Single-stage duplex compressor PDC-4-3500-3500 complete with instrumentation and controls and closed loop water cooling system for Cylinder filling. Delivering hydrogen at 145 Nm3/hr based on 1000 psi suction, 2400 psi discharge (68 barg, 165 barg), 15 hp (11 kW) motor. 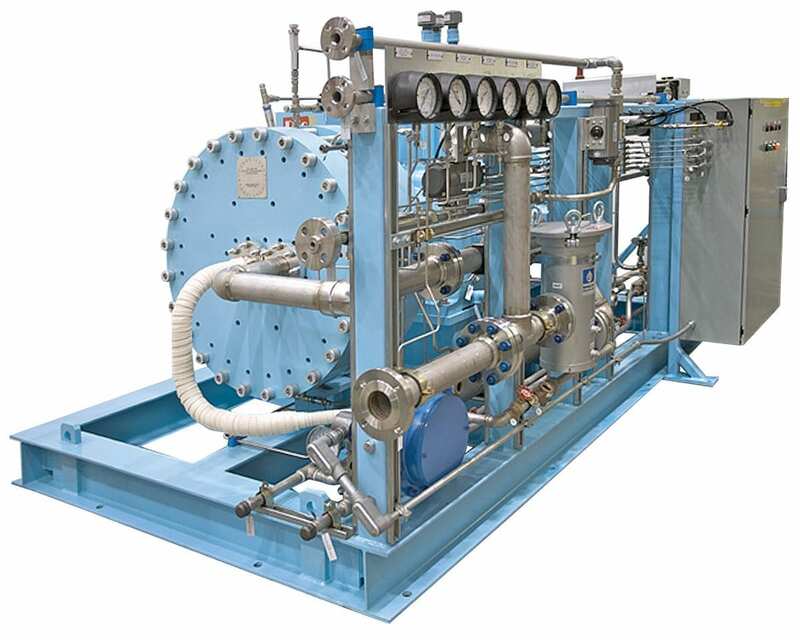 PDC-4-800-3500, 25 hp (18 kW) two-stage fully instrumented high pressure reciprocating diaphragm compressor for transferring breathing grade mixtures of helium and oxygen for use with its Saturation Diving Systems. Using the compressing in conjunction with a blender, the system can blend its own gas and help eliminate the need for large amounts of pre-mixed gas, which saves storage space and weight. This compressor is used every day while the system is in the Diving mode. 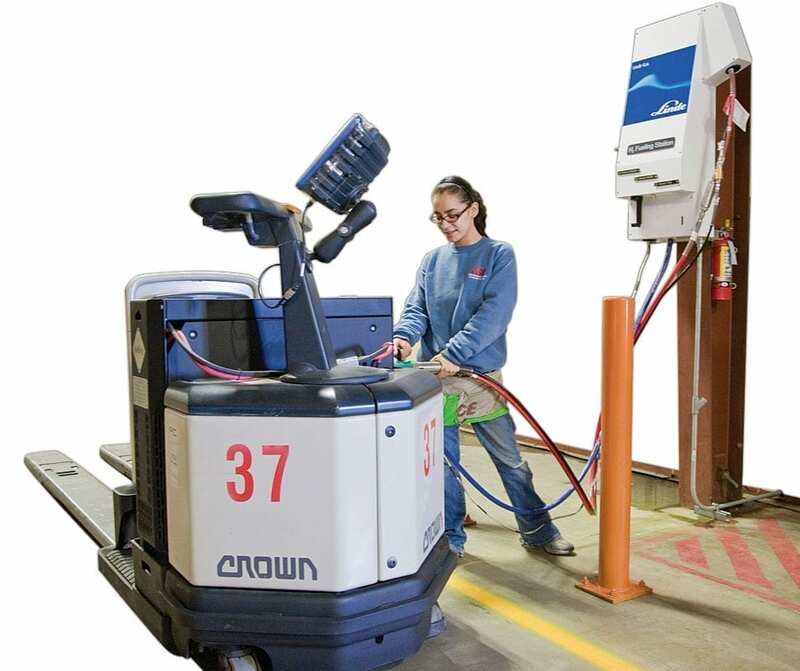 Hydrogen fuel cells for material handling. Two-stage hydrogen diaphragm compressor supplied to Air Liquide for 350 and 700 bar re-fueling, as part of it’s hydrogen refueling station located in Korea for the Korea Automobile Testing & Research Institute (KATRI). Pumping gases such as Argon, Butane, Carbon Dioxide, Carbon Monoxide, Tetrafluoroethylene, Ethane, Octane, Methane, Ethylene, Fluorine, Helium, Hydrogen, Hydrogen bromide hydrogen chloride, Krypton, Neon, Nitric oxide Nitrogen, Nitrogen trifluoride, Oxygen, Silane, Sour Gas, Xenon and many more. If you are not currently using a diaphragm compressor, chances are you are sending tube trailers back with non-refundable levels of unused gas. Or perhaps you are filling cylinders partially while waiting for the next trailer. In either case, you are losing time, money, or both. But if you were using a PDC Machines diaphragm compressor, you’d be able to draw your gas sources from high pressures down to a minimum return level and enjoy two benefits. You’d avoid being charged for any unused gas, and at the same time you’d be completely filling your cylinders and lowering your fill cycle time. Also, having a PDC Machines diaphragm compressor at your site gives you the ability to top up your ground storage during off peak times and allows you to cascade fill your cylinders during peak fill times. This lowers your fill cycle time and saves you time and money. If you are moving gases from tube trailers or gas generators, or compressing flash off from liquid storage, PDC Machines’ diaphragm compressors are the ideal choice. Built to last and designed for reliability, our transfilling and cylinder filling diaphragm compressors are in use worldwide supporting the transfilling and cylinder filling operations of major gas producers, distributors and supply houses. Our diaphragm compressors are the best choice for high purity cylinder filling. The triple diaphragm design guarantees that the process gas will not be contaminated nor will it be vented to the atmosphere due to blow-by entering the crankcase. This means that high purity gas will remain high purity. 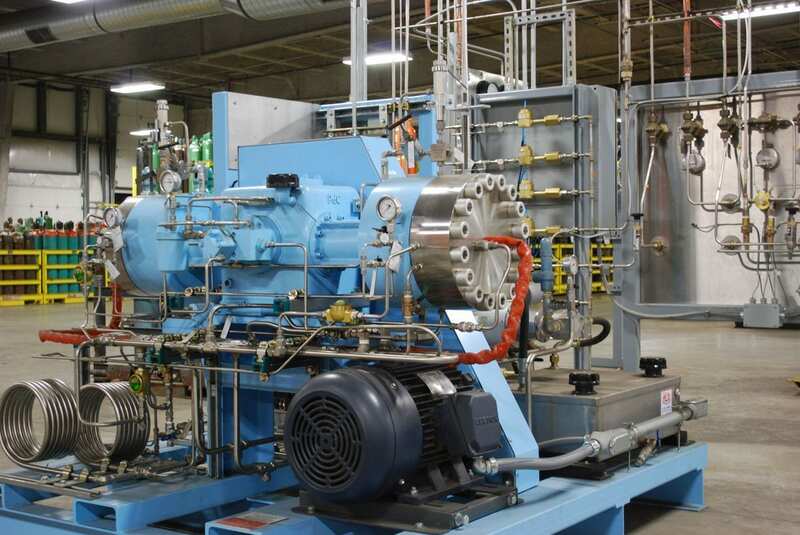 If you’re transfilling any type of gas such as monosilane, nitrogen trifluoride, silicon tetrafluoride, oxygen, fluorine, hydrogen, argon, helium, neon, deuterium, nitrogen, ethylene, carbon dioxide, carbon monoxide, methane, sour gas, our diaphragm compressor will allow you to do it safely, cleanly and reliably. Whether you are transfilling from tube trailers, cylinder filling for resale or bottle filling for lab use, a PDC Machines diaphragm compressor is the right tool for the job. At the request of our customers, PDC Machines can package our compressors and customers equipment and instrumentation inside a container. Standard ISO sea container of varying sizes with double doors at end (8 foot side). Removal of the normal combustible wood floor and insertion and welding of a steel floor, painted. Custom painted per customer requirements. Louvers to allow for free flow of air during normal operation conditions. Roof Turbine to evacuate any trapped gases in the ceiling area. Interior maintenance light for night time service. Gas detection tied to an estop circuit to stop compressor in the event there is a high concentration of gases in the container. This detector would be connected with a beacon on the top of the container to warn operators of a hazardous condition, as well as a horn to sound. Heater for locations in cold climates. 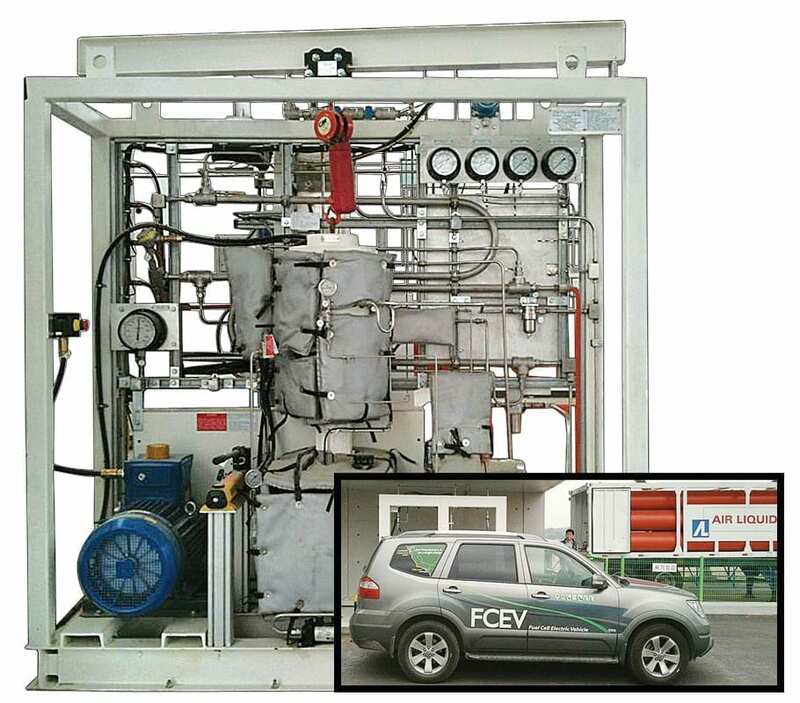 Highly reactive gases service: For compression of oxygen, fluorine and other highly reactive gases, PDC Machines performs rigorous cleaning procedures in a clean, dust-free environment. We use fire-resistant oil for the hydraulic system. We construct the process side diaphragm as well as the inner and outer check valve components. Diaphragm compressors, by design, cannot tolerate any free liquids in the gas stream. It is critical for the source of gas to be clean and dry, i.e it does not contain water mist, droplets, oil mist, water vapor, or any other gases that could condense during any phase of compressor operation through final discharge. To help maintain gas purity we install single or dual 10 micron inlet filter systems. PDC Machines has long been a proponent of hydrogen as an energy carrier. Over the years we have partnered with the largest gas producers, technology and research companies to create practical and commercial worldwide acceptance of this concept. 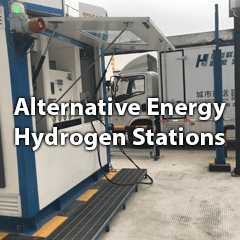 The success of these partnerships is well documented as PDC Machines’ hydrogen compressors are the preferred choice in more than 110 high profile hydrogen stations currently in use for vehicles, buses and material handling. PDC Machines continues to pursue the goal of cost effective solutions to deliver high pressure hydrogen. 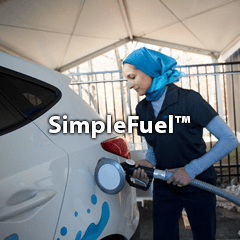 We are proud to be taking a leading role as a component supplier, promoting the growth of commercial hydrogen refueling stations. PDC Machines is actively refining and improving our technology and manufacturing methods used for 350 and 700 bar gas compression to enable commercialized solutions to take hold in the emerging marketplace. For Further information about Fuel Cells and Applications visit our Alternative Energy/Hydrogen Stations web page.